Do you have a future geologist or treasure hunter on your hands? 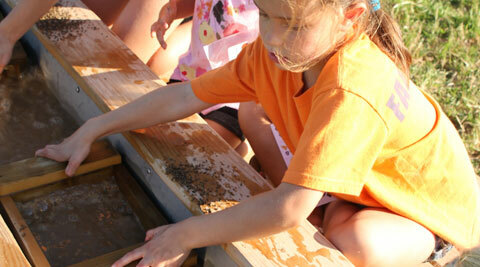 If your child enjoys exploring the land for unique and interesting rocks, they will love our gemstone mining! This is a well-received educational hands-on activity enjoyed by all ages. Everyone enjoys panning for treasures and this year those who participate can use the sluices to pan for fossils and gemstones. What unique treasures will your child find? Our affordable gemstone mining attraction includes a bag of mining rough (material that contains gems that gets sifted), an educational ID postcard, and a take home keeper bag for storing the treasures your child mines. An assay station helps in the identification of the gems. This makes our gemstone mining adventure not only a fun activity, but a great learning experience as well! Children love fun things to do in the fall and are eager to return more than once for this experience! Parents can purchase tickets for the gemstone mining at the Gemstone Café (next to the mining sluices!). Ticket prices vary from $5-$8 depending upon which size bag of rough you wish to purchase for panning. This is a well-received educational hands-on activity enjoyed by all ages. Everyone enjoys panning for treasures and this year those who participate can use the sluices to pan for fossils, as well as gemstones. Each bag of mining rough includes an educational ID postcard and a take home keeper bag for storing the treasures. An assay station helps in the identification of the gems. Children love fun things to do in the Fall and are eager to return more than once for this gemstone mining experience!